Invasion from Planet Wrestletopia: Date with Destiny! and Two Worlds Enter, One Leaves! "How did you find the ending to The Rose of Sebastopol". When I read that question I became intrigued and raced to finish the book. I wish I hadn't. 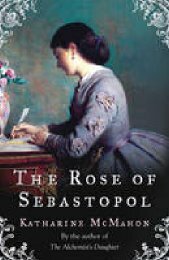 The Rose of Sebastopol is about Rosa Barr, a young, beautiful headstrong girl who storms into the Crimean war in defiance of Florence Nightingale to become a nurse to the wounded soldiers. However after some time, her family hear no word from her and they become worried, especially her beloved cousin Mariella Lingwood. Mariella takes it upon herself to make the trek to the Crimea and, amongst the war, find what has become of her cousin. The writing of the book was amazing. It was detailed, the history was rich and textured, I felt as though I were in England and in the Crimea. The descriptions of Rosa were stuning, the girl sounded absolutely flawless. I absolutely loved this book. However, I absolutely hated the ending. The ending should have been incredible. Everything was drawing up to the ending, so many questions were finally, after 400 pages, going to be answered. The ending should have been the best part of the book. Instead it felt as though the author had given up with the characters and suddenly ended the book with so many things un-answered. Maybe it's just me, maybe the ending made perfect sense to everyone else and I had missed something but I was really disappointed after finishing it. However, after all that, I would recommend that you read the book because, the writing is beautiful and it's certainly gripping!